A few weeks back I explained in my column at Football Study Hall “why your team’s new head coach is from the AAC.” Matt Rhule, Tom Herman, and Willie Taggart all used successful stints in the league as launching pads to the Baylor, Texas, and Oregon jobs respectively. AAC football is a wonderful thing and the best teams in that league regularly take down Power-5 programs. But as it happens, these three coaches didn’t face each other that often in league play. Herman and Taggart never squared off, Taggart and Rhule were joined together in the East division for 2015 and 2016 and split their matchups, Rhule and Herman faced off just once in the 2015 AAC Title game. That game wasn’t a particularly exciting one. Houston jumped all over the Owls early and eased off the accelerator with a 17-3 lead at halftime, eventually rolling to a 24-13 victory. However, I think it’s interesting to examine how Rhule’s defense went about handling Herman’s Houston offense since these coaches will now be facing off annually in the Big 12. The Temple defense acquitted themselves reasonably well and that particular showdown will be instructive for how these two coaches match up as well as how Rhule will try to defend Big 12 spreads. The Owl defense did a very good job of limiting the Houston passing game and made star WR DeMarcus Ayers a total non-factor. Ayers didn’t catch a single ball and wasn’t involved in the run game, the only time he touched the ball was on a pair of punt returns that netted five total yards for the Cougars. However, Temple was totally gashed by the QB run game and the contest was put out of reach for their own offense due to their inability to stop Greg Ward Jr from running amok. Houston’s second and third touchdowns (the latter of which put the game on ice) were sparked by Ward runs of 47 (TD), 9, 25, and 10 (TD) yards. The Owls rolled with nickel personnel for most of the game even against 5-wide spread sets from Houston because they had a pair of ILBs in Jarred Alwan and Tyler Matakevich that they really liked. There’s so much that’s instructive about this lineup for what a Waco-based #RhuleofLaw could look like. Rhule is set apart from other coaches in how well he drew in overlooked scrappers and fashioned them into a fierce defensive unit. He relied heavily on Northeastern kids, especially from New Jersey, but also just on kids no one else really wanted. The DEs Reddick, Martin-Oguike, and Smith were built more like OLBs and Rhule would often use them that way, dropping the boundary DE into the flat and bringing either on stunts. Flexibility and versatility is clearly the name of the game in this defense and Rhule tried to move people around to create different leverage either to attack Houston up front or to shore up the back end. The gameplan for stuffing Herman’s smashmouth spread, with its dual stress points on the perimeter and up the gut was a diverse combination of defenses that included some man-free, cover 4, and even some Tampa 2 coverage. They kept a man on Ayers, even on short bubbles, and they did what they could to keep ILBs Jarred Alwan and Tyler Matakevich in the box to stop the run. They also moved players around up front to cause confusion for Houston’s spread-option game, but they were done in by Ward. 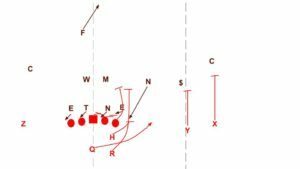 This was Temple’s favorite way to deal with Houston’s “spread-I” formations that included an H-back in the backfield to allow them to execute two-back runs. They’d drop their strong safety over the slot and use the nickel as an extra man in the box to be a free hitter or else allow their ILBs to flow to the football. The problem here was that their blitz call stunted their DL towards the OL when the OL were executing a “QB stretch” outside zone run in which they were trying to reach block the DL. In other words, they were moving in the exact direction in which Houston wanted to seal them. The nickel crashed right into the H-back, the right tackle was able to head up field quickly and cut off the middle linebacker, and if there was any hope of Matakevich scraping hard enough to be the free-hitter and make the play it was erased by the RB becoming an extra blocker and cutting him off as well. The Owls try to spill the ball to their ILBs, both of whom are aligned to be able to help on the bubbles. Houston is running “dart” which has been a Big 12 fave recently because it creates down block angles for everyone but the pulling tackle and most B12 teams have at least one really good tackle that can pull. Temple is pretty much beat here in terms of making a tackle before the first down marker because Alwan and Matakevich can’t arrive in time. The bigger problem comes from the fact that this play asks Matakevich to tackle Ward, Jr in space. He fails to do so and then it’s six points and 17-0 Houston. Temple was in a dime package that was pretty small across the board. 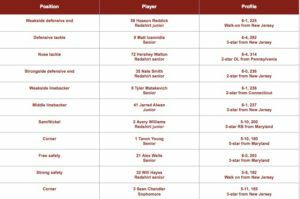 They had star DT Matt Ioannidis in at the nose with their versatile DE/OLBs Praise Martin-Oguike and Haason Roddick as the DEs. Interior anchors Matakevich and Alwan were still out there along with their normal nickel and safeties but they also had redshirt junior Nate L. Smith (6-0, 185) in at dime-backer with Alwan and Matakevich. They’re running “America’s blitz” so named because every team in America runs it. 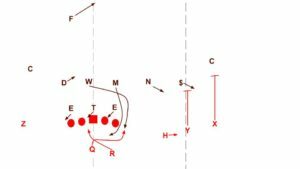 The design is to attack the QB’s natural read of the option play by overload the read-side while playing man coverage on the bubble route. The QB sees the cover down on the bubble so he’s not throwing that and he sees the DE/OLB crashing to tackle the RB so he’s not handing off even though the OL has numbers on the zone play. The goal is to force the QB to pull the ball and then the extra edge blitzer can smack him down, allowing the defense to get a hit on the QB and hopefully a negative play. Unless the free-hitting blitzer gets juked by the QB and the signal-caller then takes advantage of the OL’s numerical superiority to fire through the cutback lane. It was game over by this point. The 2015 Houston Cougars were really good at attacking opponents on the perimeter with Demarcus Ayers (1222 receiving yards) and between the hash marks with Greg Ward, Jr (1253 rushing yards). The Temple Owls were really good at disrupting opponents and keeping the ball inside the hash marks where Tyler Matakevich (107 tackles, 15 tackles for loss, 4.5 sacks) was always on patrol. Matt Rhule set the game up into a contest of Matakevich vs Ward between the hash marks and Herman’s man won thanks to “ultimate spread” run game tactics that gave Ward enough space to do what he did best.